A suicide bomber ripped through a crowd of Pakistanis queueing for government wheelchairs in a busy market in the lawless northwest on Friday, killing 17 people and wounding another 100. Administrator Maqsood Ahmed told AFP the blast took place at an office in Yakaghund town in Mohmand, one of seven districts that make up Pakistan's tribal belt that Washington has branded a global headquarters of Al-Qaeda. The nuclear-armed Islamic republic is on the frontline of the US war against Al-Qaeda and the Pakistani military are bogged down fighting homegrown Taliban in its northwestern border areas that lie outside full government control. 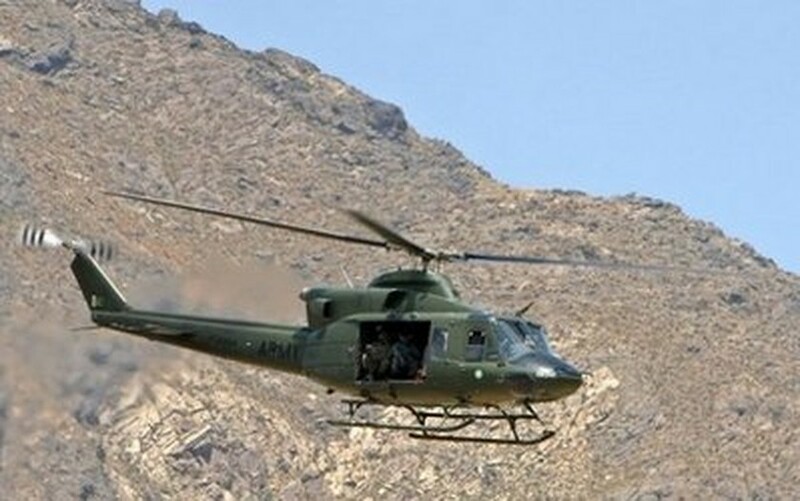 File photo shows a Pakistani Army helicopter taking off from a paramilitary compound in the northwest tribal district of Mohmand. Witnesses said a huge explosion damaged the administration office, shops, a local jail and other buildings in the small town not far from the border with Afghanistan, where 140,000 US-led foreign troops are fighting the Taliban. "The death toll is 17. There are about 100 people were wounded. It was a suicide attack," Ahmed told AFP. "A function was held at the office to distribute wheelchairs. A lot of people had gathered outside the office," he said. "It caused damage to the office and also damaged the wall of a local jail. Several prisoners have managed to escape." Doctors at three hospitals had earlier put the combined death toll at 12. A Taliban and Al-Qaeda-linked bombing spree across Pakistan has killed more than 3,400 people in three years since government troops besieged a radical mosque in the capital Islamabad in July 2007. Hugging the border with Afghanistan, where US and NATO allies are trying to end a nearly nine-year war, northwest Pakistan has suffered a wave of bombings causing mass casualties and insurgency, fanning fears about regional stability. Pakistani leaders this week called for a landmark national conference to develop a strategy to counter the Islamist militant threat after a twin suicide attack killed 43 people at a shrine in Lahore on July 2. In a rarity for the fractious world of Pakistani politics, the government said all major parties would be invited to the conference to find ways to eradicate terror and curb the problems of militancy. The details and date of the possible conference have not been made clear. Interior Minister Rehman Malik has said sectarian militant groups based in the central Punjab province, Lashkar-i-Jhangvi and Sipah-e-Sahaba, are colluding with Taliban and Al-Qaeda to recruit footsoldiers. Young men were sent to training camps in the tribal belt and dispatched as bombers and militant cells back to Punjab and other cities, officials say. Pakistani security forces have fought in the tribal belt and parts of the northwest for years, but deadly clashes are still largely a daily occurrence.